Nick Young fielded interest from the Golden State Warriors, Oklahoma City Thunder and New Orleans Pelicans after free agency began at 9:01 pm PT on Friday, according to league sources familiar with the situation. Though the Lakers also contacted Young’s representatives during that time period, both the Lakers and Young have conflicting agendas that suggest the end of their four-year tenure together. Ironically, the Lakers have prioritized outside shooting partly because of Young’s expected departure. Following two frustrating seasons filled with losing, declining production and clashes with former Lakers coach Byron Scott, Young thrived better under first-year Lakers coach Luke Walton. In the 2016-17 season, Young averaged 13.2 points on 43 percent shooting and surprisingly impressed the team’s coaching staff with his defense through 60 starts. Under Scott, Young averaged 13.4 points on 36.9 percent shooting in 2014-15 before posting career-lows in points (7.3) and shooting percentage (33.3). 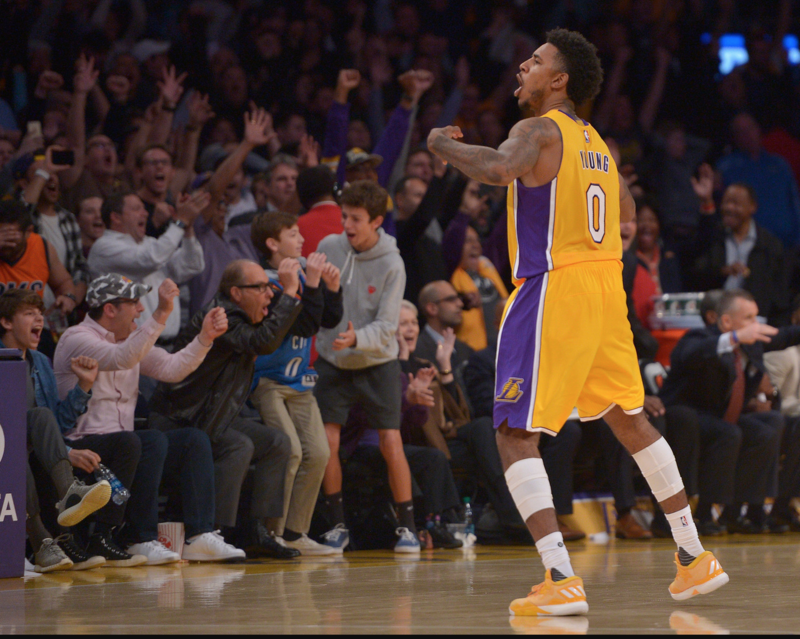 Young, who starred at Cleveland High of Reseda and USC, initially joined the Lakers in 2013-14 and instantly became a fan favorite for his production, hometown roots and playful personality in an otherwise tumultuous season that ended with a 27-55 record. The Lakers then fielded key injuries to Kobe Bryant and Steve Nash, while having split feelings about former coach Mike D’Antoni and his fast-paced offense. But Young thrived under D’Antoni, averaging 17.9 points on 43.5 percent shooting in 64 games. After missing out on James and Carmelo Anthony in the 2014 offseason, the Lakers resigned Young to a four-year, $21 million deal. But with the Lakers hiring Scott to replace D’Antoni, Young did not find the same comfort level under Scott’s more stern approach and less emphasis on outside shooting. Scott often griped about Young’s inconsistency, his defense, playful personality and tardiness before the designated time to arrive to the arena at least 90 minutes before tipoff. Young then became frustrated with Scott’s consistent criticisms and system. Those frustrations heightened late in the 2015-16 season when former Lakers guard D’Angelo Russell inadvertently leaked a video that showed Young admitting he was unfaithful to his former fiancee, hip-hop artist Iggy Azalea. Then, the Lakers were expected to part ways with Young amid concerns of locker-room tension. But the Lakers decided to retain both players for Walton’s first season. Young also publicly made amends with Russell before having his bounce-back season under Walton that included competing in the NBA’s 3-point contest during All-Star weekend in New Orleans. if he wants a ring, he knows where to go.